Getting the right look, set the right mood, and find the right size chandelier is more than just picking a design you are immediately drawn to. True, that may be exactly the chandelier you end up getting, and it may work perfectly in your space—but why take the risk when you can know for sure? Let us help you take the guesswork out of chandelier shopping right now with this step-by-step guide on how to find the right chandelier for your space. Measure your room from floor to ceiling, and figure that there should be 2.5-3″ of chandelier height per foot. (For example, a 10-foot ceiling should have a 25- to 30-inch high chandelier.) In addition, it is recommended to have at least 4 feet of clearance between the chandelier and any adjacent walls. You will also need to factor in the size of your dining table. 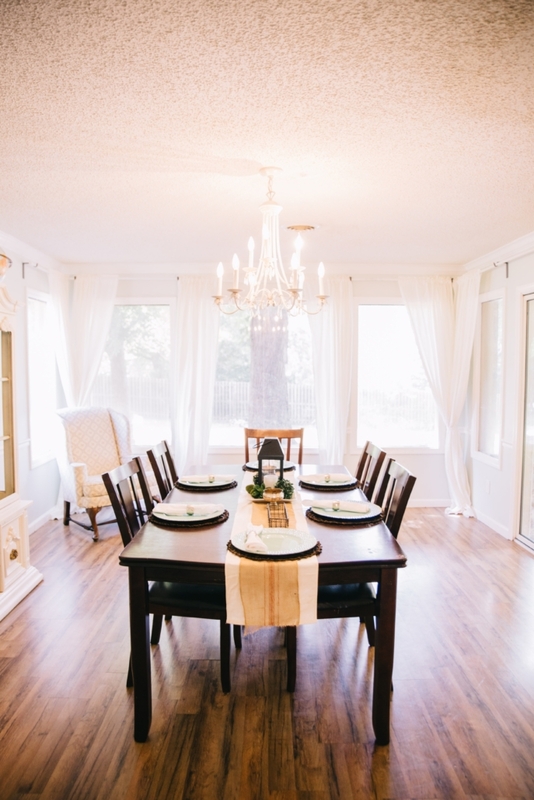 A good rule of thumb to ensure that your chandelier size works well with your table is to choose a chandelier with a width that is ½ to 2/3 the size of your table. Hanging your chandelier at the right height is also paramount. Hang it too low and you run the risk of someone hitting their head. For this reason, we recommend a clearance of 7 feet between the bottom of the chandelier and the floor. 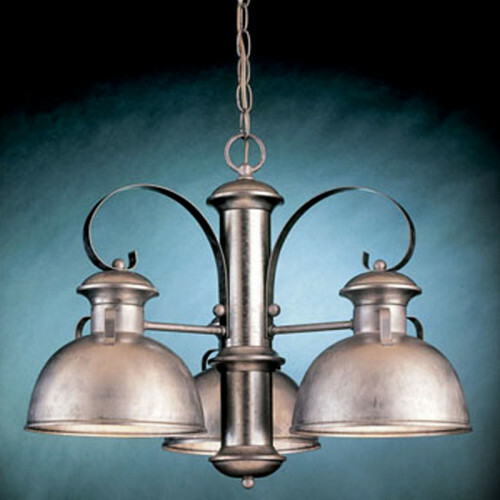 For standard ceilings, the bottom of your chandelier should hang 30-34″ from the table top. 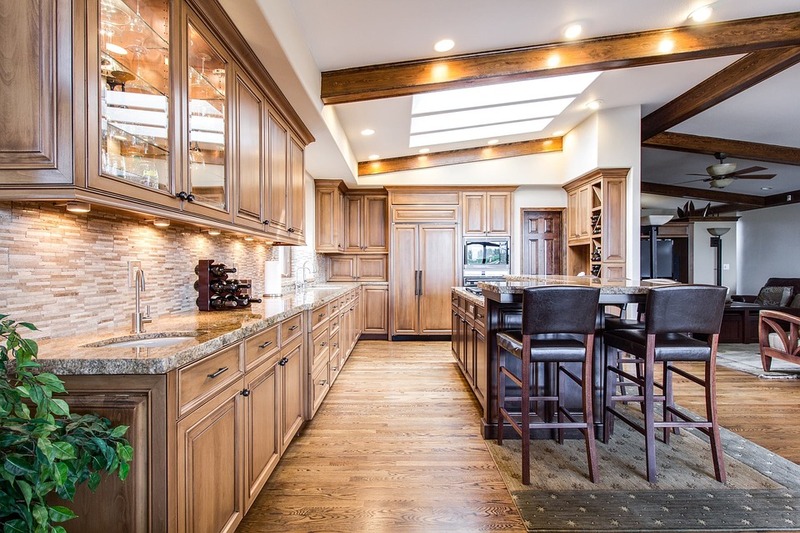 For high ceilings (higher than 8′), the recommendation is 36-40″ from chandelier to table top. 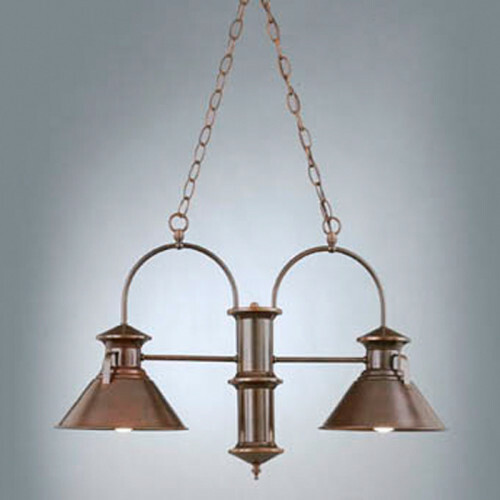 Now comes the fun part: choosing a chandelier style that matches your style and complements the space. 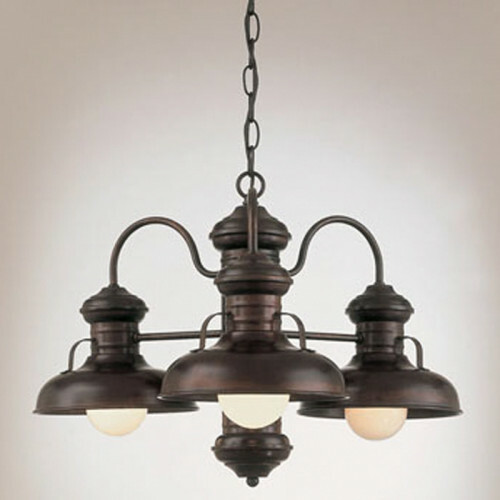 For example, are you looking for a rustic chandelier, like our 3-Shade Prairie Barnlight Chandelier? 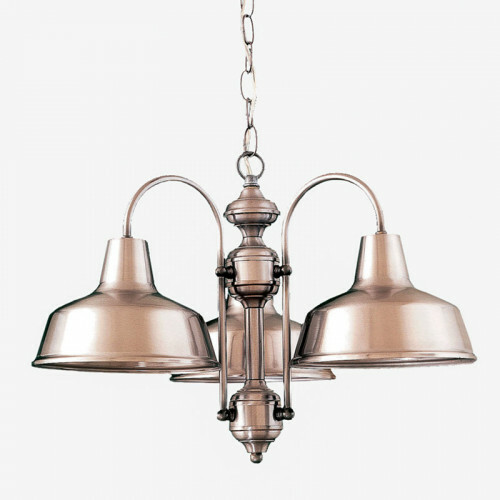 An industrial chandelier, like our 4-Shade Seaside? 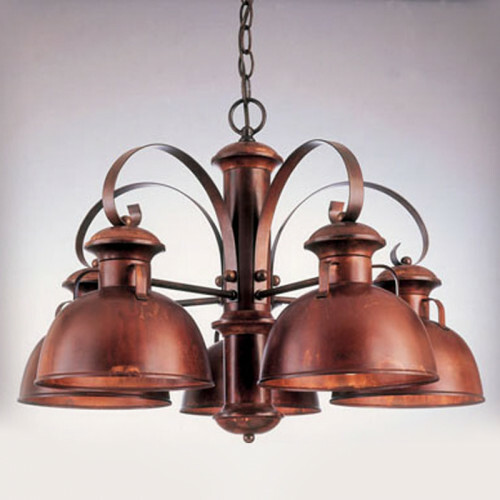 Or how about a modern farmhouse chandelier, like our 3-Shade Barnlight? Do you want one dripping with crystals or are you looking for a more streamlined chandelier style? 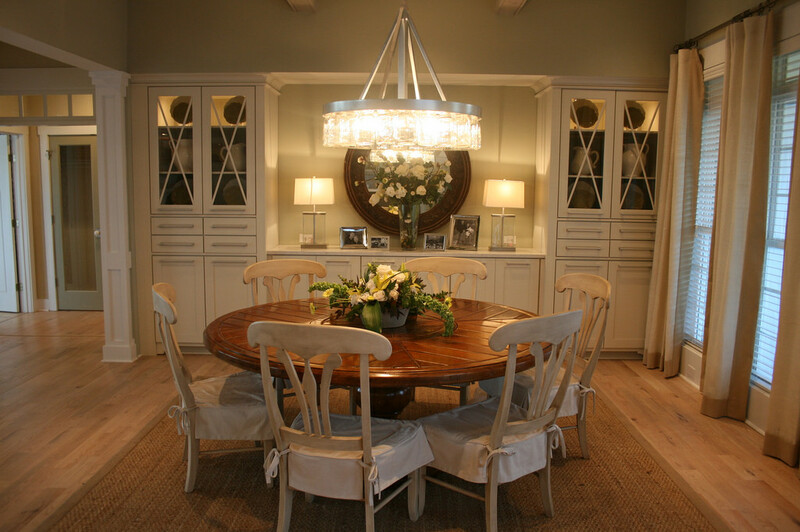 Chandelier lights and fixtures play an important role in the ambiance created in a dining room. In addition, the shape of a chandelier must work stylistically with the room and furniture, and also disperse light evenly over the table. 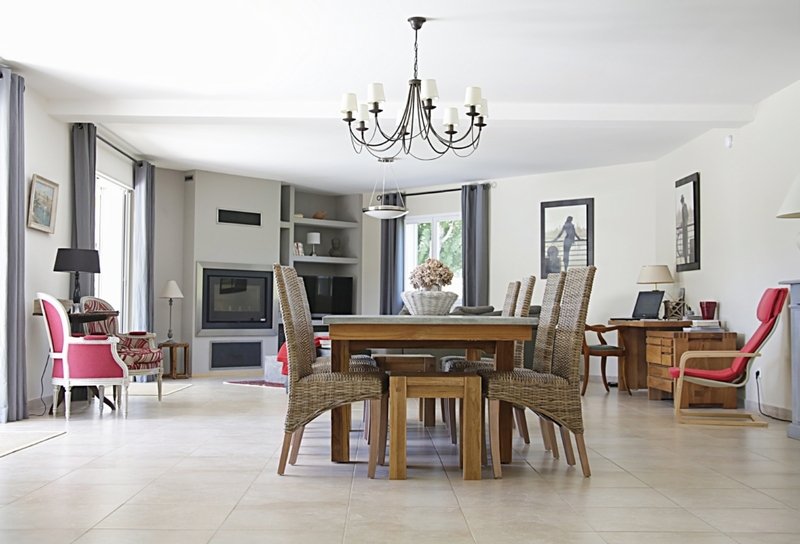 One common mistake is expecting the chandelier to be effective as the sole source of light in a dining room, but that is simply not the case. The lighting from a chandelier should be more about setting a mood and creating ambiance in a room, which is why creating a “layered” lighting scheme in your dining room with secondary light sources is a better plan. Layering lighting using recessed lighting, wall sconces, table lamps and other light sources to supplement your chandelier lighting. This will give you the ability to light your dining room for both high-light activities (such as when you use the table for a work space or kids use it when doing homework) and low-light activities (such as a dinner party or a romantic dinner). We’re glad to help you get the right chandelier—size, style, and light level—that you want for your space. 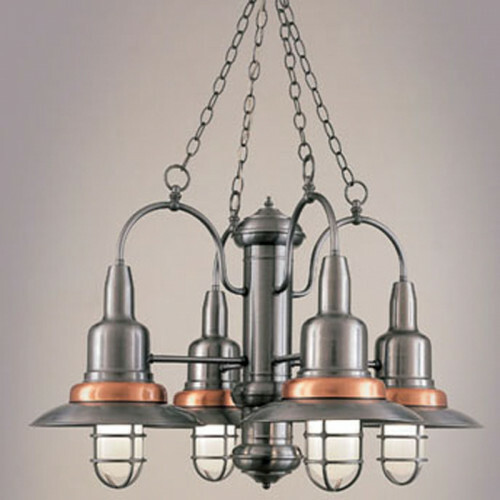 Check out our Chandelier Buying Guide for general information on hanging chandeliers in any space. Please feel free to call us with questions: 1-888-320-0630. You can also visit us at www.fabby.com.